Spice up a short-term visit to America’s Finest City with the great temporary housing available at Foxwood Corporate Apartments! With a convenient location, relaxing features, and onsite facilities, what more could you want out of San Diego’s temporary housing? At Foxwood Corporate Apartments, you’ll have it all. Live like a local and enjoy your time in San Diego in fully furnished, designer decorated apartments that are fit for a king and queen. Whether you’re taking in San Diego’s major sights and attractions or vacationing with a purpose, the accommodations at Foxwood Corporate Apartments will be ideal for your commute. Located just blocks away from the I-805 and I-5 freeways, Foxwood Corporate Apartments acts as a great home base with easy access to get you on the way to your desired destination quickly and efficiently. Along with comfortable temporary housing, you’ll have a relaxing oasis just steps from your front door. The heated pool and spa in the center of our temporary apartments is open year round with plenty of lounge chairs to bask in the sun poolside and you’re welcome to go for a swim whenever you’d like. To top it all, the lush green surroundings of Foxwood Corporate Apartments ensures that you’ll have the perfect ambiance to help you relax. If you have little time to spare during your vacation, make sure you utilize our additional services available at Foxwood Apartments. Our onsite parking makes it convenient to run in and out and hop on the freeway quickly. We also have onsite laundry facilities that all guests may use, so you won’t have to may big trips to the laundrymat whenever you need to wash your clothes. You will also have free wifi, copy and fax services, and maid services that can all be yours on a temporary stay in San Diego. Contact us today and we’ll get you started on finding the best temporary accommodations in San Diego. We look forward to your temporary stay in America’s Finest City! Finding a great temporary place to call home in a foreign city isn’t an easy task. With Foxwood Corporate Apartments, we give you the best combination of practical living and resort-style luxuries in the gorgeous city of San Diego. No matter how long you’re staying in San Diego, you deserve to enjoy your temporary stay in a peaceful, country club setting. Here at Foxwood Apartments, we have one- and two-bedroom fully-furnished apartments including all utilities paid, a full size kitchen, and all the daily essentials you’ll need to make your trip extra special. There’s a full list of the included amenities located on our website; see what could be yours during your one-of-a-kind vacation in America’s Finest City. On top of a spacious apartment with breath-taking views, the 5-acres that Foxwood Apartments is located on has long, curved paths lined with large shade trees, a year-round heated pool and spa, on-site laundry facilities, and nice barbecue areas. You can invite friends over to hang out by the pool or take a relaxing dip alone after sight-seeing in San Diego. At Foxwood Corporate Apartments, we want you to enjoy your trip to San Diego, our friendly staff and convenient temporary housing ensures your stay in San Diego will be nothing but lots of fun and endless memories. Please visit us online to see photo galleries, get more information about our rentals, and start the quick and easy application process! For temporary housing in San Diego you can count on, choose the one and only, Foxwood Apartments. Wanna get away in 2014? The best way to enjoy the Southern California coast is to truly experience San Diego like a native. 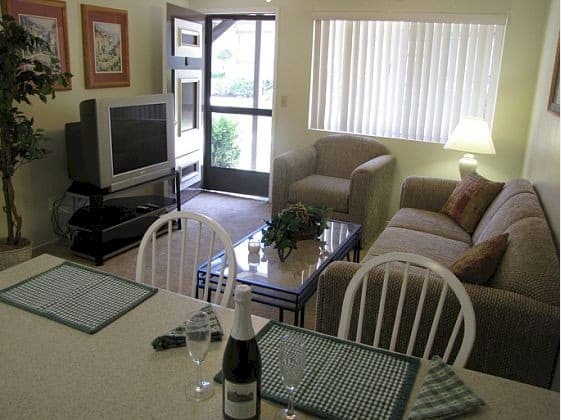 With our short-term furnished apartments here at Foxwood Corporate Apartments, you’ll be staying in a luxurious vacation rental that feels like you’re living right at home here in San Diego! The 130 fully furnished, one- and two-bedroom temporary apartments will certainly impress you during your short-term stay. You’ll be living in a peaceful, quiet, country club resort-like ambiance on 5 acres of stunning greenbelt garden park. The curved paths, large shade trees, and manicured gardens are all centered around the year-round heated pool and spa that’s ideal for lounging, swimming laps, catching some sun, or relaxing in the Jacuzzi. The special barbecue area is also fun for get-togethers with friends. Aside from the fun at Foxwood Corporate Apartments, you’ll also love the interior of your temporary housing. From the spacious rooms to the designer dÃ©cor, your luxurious apartment will spare no details with household essentials and many electronics to help you live just like you would at home. In addition to your lovely accommodations, you’ll like being conveniently located near the major I-805 and I-5 freeways with lots of restaurants, shops, a Vons supermarket, Wal-Mart, and the new movie theater are all just 2 blocks away. Contact us today if you have any questions or need more details about our temporary apartments available at Foxwood. We’re the perfect blend of real-life living and a dream retreat, Choose Foxwood Apartments as your home in San Diego! A temporary stay in San Diego is a truly extraordinary experience. There are so many special attractions and scenic destinations that you must see to believe!Â You can amplify your unforgettable temporary vacation to San Diego with spacious and luxurious apartments! Foxwood Apartments can provide you with a beautiful, fully furnished apartment surrounded by a serene greenbelt garden park and a handful of relaxing features. A temporary stay doesn’t have to be spent in a cramped hotel with minimal amenities; stay with Foxwood and you will not be disappointed! At Foxwood Apartments, we have comfortable accommodations fit for a family, couple, or single travels with the option of 1- or 2-bedroom housing. Every one of our short-term apartments have been designer decorated with durable appliances, cozy furnishings, and upscale art and dÃ©cor. Every apartment is equipped with a full-size kitchen and all the kitchenware, cookware, and utensils to enjoy a home-cooked meal. We also have quaint dinette areas that are perfect for an intimate dinner or a glass of wine in the evening. There are so many amenities here at Foxwood Apartments! Check out a full list of amenities to see what could be yours during a temporary stay in San Diego. In addition to our long list of amenities, the location is another perk you’ll truly appreciate if you plan on commuting to work or school or you’d like to explore San Diego’s plethora of cool places and distinct venues. The I-805 and I-5 freeways are just blocks away from Foxwood Apartments, Simply hop on the freeway from our on-site parking and you can get to any area of San Diego County in no time at all! Come explore the wonders of America’s Finest City, Do it in real San Diego fashion with a spacious, fully furnished apartment to call home! 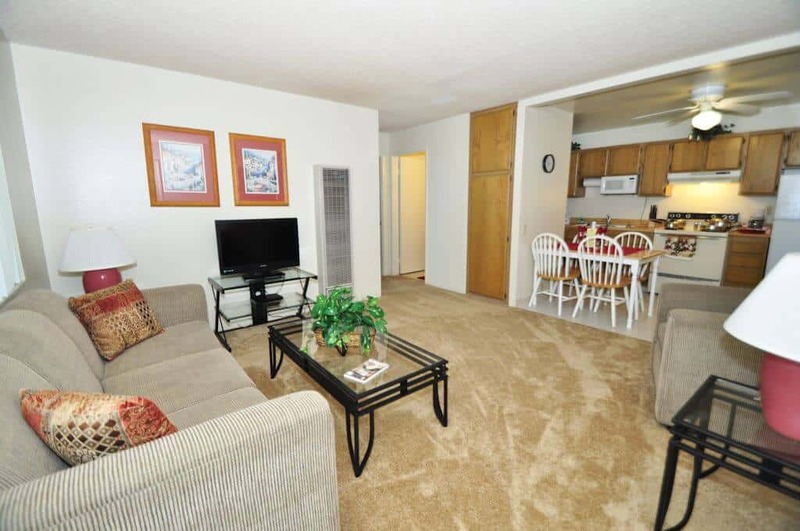 For more information about our apartments, photo galleries, and easy location, visit us online. We look forward to your unforgettable temporary stay at Foxwood Apartments! Get onboard with Foxwood Apartments’ premium accommodations with an endless supply of essential amenities! San Diego’s Foxwood Corporate Apartments is ideal for any traveling vacationer, businessman, or military service member. For the best solution for temporary housing in San Diego, look no further than the stunning ambiance of Foxwood Apartments. Whether you’re in San Diego for work or play, you will thoroughly enjoy your stay in the country club setting of Foxwood Corporate Apartments. 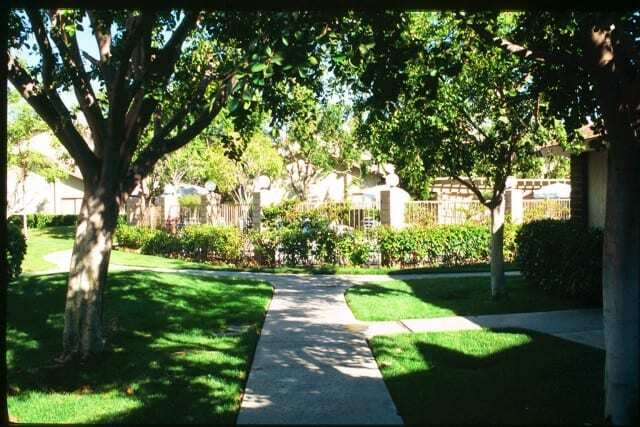 A gorgeous greenbelt garden park filled with large shade trees and pristine gardens surrounds our apartments. On top of green scenery and lush surroundings, Foxwood Corporate Apartments also has a heated pool and spa that’s perfect for relaxation at any time of the year. Located just steps away from your temporary apartment, this convenient access to the pool and spa allows you to relax at any time of the day. In addition to the heated pool and spa, Foxwood Apartments also offers additional services such as laundry facilities, fax and copy services, and weekly maid service. However, the endless supply of amenities doesn’t stop at the exterior of your temporary apartment. Each and every one of our temporary apartments is fully furnished with designer dÃ©cor that will allow you to feel at ease even if you aren’t at home. The full size kitchen is equipped with all your living essentials from new appliances to all necessary dishware. Gorgeous views, luxurious amenities, and a spacious layout are just some of the perks you’ll love at Foxwood Corporate Apartments. Check out our full list of amenities included in your temporary stay. For a once in a lifetime experience in San Diego, Foxwood Corporate Apartments is complete with all the essentials you’ll need to live comfortably. Contact us today for more information on temporary apartments and our easy application process. Expect nothing but the best from Foxwood Apartments, great rooms, loads of amenities, and much more can all be yours during a stay at Foxwood.